By Rachel Held Evans, on February 06, 2012. Last week, we talked about the way in which the word “biblical” gets tossed around so carelessly these days—“biblical” politics, “biblical” courtship, “biblical” economics, “biblical” manhood, “biblical” womanhood—and how any claim to a biblical lifestyle or perspective is inherently selective. 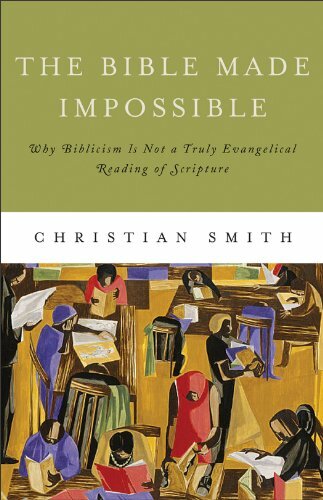 This week, I want to highlight some of Smith’s observations in Chapter 4, where he writes about “subsidiary problems with Biblicism.” For Smith, these include: 1) blatantly ignored teachings, 2) arbitrary determinations of cultural relativism, 3) strange passages, 4) populist and ‘expert’ practices that deviate from Biblicist theory, 5) lack of Biblicist self-attestation, 6) the genuine need for extra-biblical theological concepts, 7) the dubious genealogy of the Bible-only tradition,8) lack of a Biblicist social ethic, and 9) setting up youth for unnecessary crises of faith. Let’s focus on those blatantly ignored biblical teachings that challenge the simplistic, blueprint approach to reading the Bible. Of course, these are just three of many passages of Scripture that are overlooked or ignored, even by those who claim to interpret and apply the Bible literally. Obviously the list could go on and on. The point of this whole discussion, as far as I’m concerned, is that we are ALL selective in our interpretation and application of Scripture. It will not do to spend our theological debates accusing one another of “picking and choosing” from Scripture when selectivity is something in which we all engage. Why do we pick and choose the way that we do? The truth is, how we “pick and choose” from Scripture often says as much about us as it says about the Bible. So, in a sense, our selective habits can serve an important instructive function in the life of followers of Jesus. What do our selective readings say about ourselves and what we want to read into Scripture? Are we reading with what Peter Rollins calls a “prejudice of love” or are we reading with prejudices of judgment, power, hatred, and fear? What do our hermeneutial impulses say about ourselves? When we approach Scripture, what are we looking for? How should we pick and choose? This will be our topic for next week. What are some other troubling/strange/forgotten passages of Scripture that rarely make it to our desk calendars or sermon outlines? What do you make of the fact that we all “pick and choose” from Scripture?